10 FWY East - 60 East exit Paramount/Montebello Blvd. turh Right then Right again on montebello Blvd. 60 FWY West exit Paramount/Montebello Blvd. turn Left then Right on Montebello Blvd. 5 FWY North exit Slauson/Montebello Blvd. turn Left on Telegraph Road then Right on Greenwood Av. will turn into Montebello Blvd. 605 North exit Whittier Blvd. turn Left until Montebello Blvd. 5 FWY South exit Garfield Right on Garfield, Left on Greenwood Av. will turn into Montebello Blvd. 605 FWY South to 60 FWY West exit Paramount/Montebello Blvd. 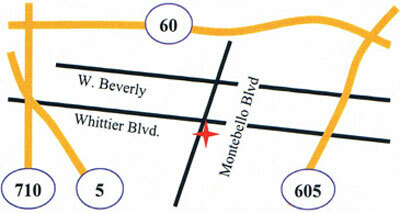 turn Left then Right on Montebello blvd.